Bruce Croxon is not as popular as some of the other dragons on Dragon’s Den as he had always maintained a very low media profile. Prior to the show, he was known only in the digital world as one of the early pioneers of the internet. Croxon had a very interesting childhood. His father was a white from England and his mother was a black woman from Jamaica. During those times, mixed-marriages were uncommon. Croxon began his career in British Columbia as a tree planter. It was through this job that he learned the importance of the environment and nature. Although he was being paid 2 cents per tree at that time, he kept his focus on eco-friendly projects. In 1979, he earned his graduation from Ridley College. From there, he went to the University of Western Ontario and pursued a BA. 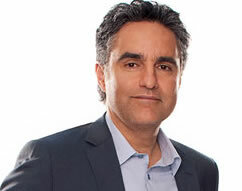 If you are a follower of Bruce Croxon, you will often notice his tweets emphasizing on the importance of education. He supports education strongly and often tells kids through his tweets to “Stay In School”. It was not until 1988 when he began to see success. He was the one who came up with the idea of digital dating. He was ahead of the pack when the online dating market exploded in popularity about ten years later. He was the co-founder of Lavalife, an online dating website. Very soon, the brand became a household name and it had over 2 million members. The website started generating revenue in the form of membership fees. After the success of his online dating business, he decided to sell his company for $180 million. Since he wanted to start something new, he started his own spa. He named his business Vita which soon became a chain of holistic spas in the west of Canada. He also founded Round 13 Capital which is a relationship-based capital venture firm focused on investing on entertainment, communication and information opportunities. Their experience and money is partnered with entrepreneurs who are focused on producing goods and services that offer value to businesses and consumers and while they achieve this, they generate returns through investments. But, his appearance on the Dragon’s Show gave him more exposure and it was through the show, he was able to expand his portfolio. When Bruce is not busy helping other entrepreneurs with their startups or operating one of his businesses, he spends his time playing golf or kayaking. He is also an avid surfer and loves skiing and biking. Currently, he lives in Toronto. He has a wife and two kids. He also has fondness for warm weather, spicy food and reggae music. His interest in technology and wellness is quite strong till date and some of his current business ventures include Walkaway Canada, Sprigg Software and Mobilemiser.com. He is also board member of Points.com and Trans Canada.